Since I moved out of gmail (for obvious privacy reasons), I was using simultaneously mutt and roundcube to access my emails. mutt is a really powerful tool to help you quickly get things done (reading, writing, searching emails). Roundcube on the other hand allowed me to access my emails from anywhere without having to setup all the needed tools. So in short I wanted to be able to read my emails from a TUI that allows me to tag (auto-tag) my emails but also allows in some way to synchronize the changes (tags, flags, ...) with the remote IMAP server. Such that I would be able, if needed, to read my emails remotely and still be able to find my way across the structure (folder hierarchy for roundcube). 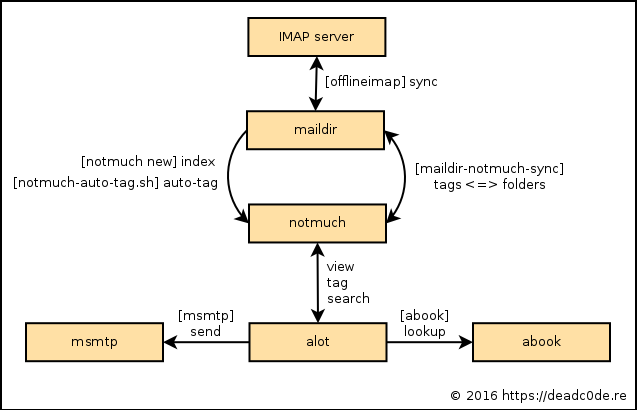 inability to synchronize tags on IMAP server (especially regarding folder structure). I then discovered notmuch which is a rewrite of sup with performance in mind. Notmuch is surrounded with very neat tools in the UNIX-philosophy "Do one thing and do it right". notmuch is not as complete as sup, it does not allow to read or write emails but only cares for indexing, searching and tagging emails. The rest is done by other specific tools as described below. using X-Keywords This method will add (or complete) the header's key named X-Keywords with a list of tags (separated by a comma). using X-labels As for previous solution, but by using the header's key named X-labels with tags separated by a space. using folders Tags are considered as virtual folders and thus translated into folders in maildir (filesystem) and on the remote mail server (IMAP server) and vice-versa. Now let's get down to the email stack itself. It is made of multiple tools, each of them doing a specific thing (and doing it right). It might seems a bit awkward at first but once setup, it is a killing email setup ! offlineimap downloads emails from an IMAP server and store them locally. It also sync your changes back to the remote server. The script maildir-notmuch-sync used as a pre- and post-hook is described in its own section below. For more information on how to configure/use offlineimap, see the official doc. notmuch is a rewrite of sup with performance in mind. It allows to tag emails and search among them. It is very fast and able to handle very large quantity of emails. Its configuration is very easy. You simply provide it with basic information on your emails and specify the tags with which each new emails is to be tagged with. This will be useful for maildir-notmuch-sync used below as well as for auto-tagging. notmuch is to be setup using notmuch setup. Then each time you have synchronized your emails (with offlineimap), simply run notmuch new to index new mails. notmuch itself can be used to auto-tag new emails. The easiest way is to add a specific tag to new emails (tofilter for example) and then process all new emails right after calling notmuch new. This means that after running notmuch new, any new email will be automatically tagged with two tags: new and tofilter. tofilter will be used here to auto-tag emails while new will be used by maildir-notmuch-sync described in following section. Now let's say you want all emails coming from [email protected] to be tagged with debian. This will remove the tag tofilter and add the tag debian to all emails which are tagged tofilter and are from the debian bugs mailing list. For more information, see the doc about initial tagging. Theses steps can be put in a bash script and run from maildir-notmuch-sync through the TAG_SCRIPT config. This script was originally written by Ethan Schoonover. It is available on github under this link. The original script's purpose is to synchronize notmuch tags with remote IMAP servers and more specifically with gmail. I modified it to be able to translate notmuch's tags into a maildir folder and thus get my emails structured on the IMAP server for access with webmail. My modified version is available here. The modified version will create a new folder (locally in maildir and remotely through offlineimap) when a new tag is used for the first time. Also emails will be copied around depending on their tags. Let's say for example that you tag a new email with two tags: family and toremember. This script will copy the email to two different folders in the maildir, the family folder and the toremember folder (and create them if they don't exist). When offlineimap will be run, those will be copied to the remote IMAP server to their respective folders. It is very convenient but also has its drawbacks. A single email might co-exist in several different folders on your maildir and on your IMAP server. alot is the interface to your emails. It is terminal based and fully compatible with notmuch. You can find more themes (with screenshots) here. This (old) screencast shows the use of alot. A good resource is the alot documentation which lists all needed configuration options. msmtp is a SMTP client that allows to easily transfer emails to an SMTP server. It is easily integrated into alot by providing an account in its config files as mentioned here. Here's the complete manual on msmtp to help correctly configure msmtp. You can also use gpg2/gpg-agent to provide a password to msmtp without writing it in clear text in the config file. passwordeval "gpg2 --quiet --for-your-eyes-only --no-tty --decrypt <password-file>.gpg"
One last thing missing to get a complete email stack is a contact manager. I found abook to fill all needed requirements. Moreover it is fully compatible with alot which uses it to auto-complete TO when redacting. BTW this script converts vcard to abook. I've been using that setup for some weeks now and am very happy with it. It is fast and the search feature is really doing it ! It takes some time to setup all the right configs and keybindings but once settle, it's a bomb ! Last but not least, TUI rocks !